Then, the system would switch from one based on farm size to one rewarding farmers for "public goods", such as biodiversity and water quality. Officials in Northern Ireland will study the speech but any decision on payments after a UK transition period ended "would be a matter for a minister", said a spokesman for the Department of Agriculture Environment and Rural Affairs. Ulster Farmers' Union President Barclay Bell welcomed Mr Gove's remarks, saying he wants to see a balance between the needs of food production and the environment. "It is a critical time for the farming industry and the sooner we have a local agricultural minister back in there the better," he added. The government had previously committed to payments for the lifetime of the current parliament, which is scheduled to run until 2022. Since December 2017, 23,500 Northern Ireland farmers have been paid almost £280m in subsidies from the European Union. Ulster Unionist leader Robin Swann called for Northern Ireland officials to mirror the commitment made to English farmers. He said he feared the absence of a local agriculture minister might delay that. 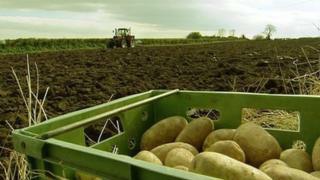 Sinn Féin said Mr Gove's comments would not allay farmers' concerns in Northern Ireland. It said the announcement was "confusing and light on detail".